PHP, Spring MVC/JSP, and Static HTML templates are available. Before downloading WebRocketX© you must agree to the following license agreement. END-USER LICENSE AGREEMENT For WebRocketX By WebRocket Software NOTICE TO USER: Please, read this carefully. By using all or any portion of the Software you accept all the terms and conditions of this Agreement. If you do not agree, do not use this Software. 1. DEFINITIONS When used in this Agreement, the following terms shall have the respective meanings indicated, such meanings to be applicable to both the singular and plural forms of the terms defined: Licensor means WebRocket Software. Licensee means You or Your Company, unless otherwise indicated. Software means (a) all of the contents of the files, disk(s), CD-ROM(s) or other media with which this Agreement is provided, including but not limited to ((i) registration information, i.e. License key which is unique for a registration name of the Licensee; (ii) related explanatory written materials or files (Documentation); and (iii) Software setup files and code samples (if any); and (b) upgrades, modified versions, updates, additions, and copies of the Software, if any, licensed to you by WebRocket Software (collectively, Updates). Use or Using means to access, install, download, copy or otherwise benefit from using the functionality of the Software in accordance with the Documentation. System means Windows OS, GNU/Linux or Mac OS X, or any virtual machine. 2. GENERAL USE You are granted a non-exclusive License to Use the downloaded Software for any purposes for an unlimited period of time. The software product under this License is provided free of charge. Even though a license fee is not paid for the use of such software, it does not mean that there are no conditions for using such software. 2.1. The Software may be installed and Used by the Licensee for any legal purpose. 2.2. The Software may be installed and Used by the Licensee on any number of systems. 2.3. The Software can be copied and distributed under the condition that original copyright notice and disclaimer of warranty will stay intact and the Licensee will not charge money or fees for the Software product, except to cover distribution costs. 2.4. The Licensee will not have any proprietary rights in and to the Software. The Licensee acknowledges and agrees that the Licensor retains all copyrights and other proprietary rights in and to the Software. 2.5 Use within the scope of this License is free of charge and no royalty or licensing fees shall be paid by the Licensee. 3. INTELLECTUAL PROPERTY RIGHTS 3.1 This License does not transmit any intellectual rights on the Software. The Software and any copies that the Licensee is authorized by the Licensor to make are the intellectual property of and are owned by the Licensor. 3.2 The Software is protected by copyright, including without limitation by Copyright Law and international treaty provisions. 3.3 Any copies that the Licensee is permitted to make pursuant to this Agreement must contain the same copyright and other proprietary notices that appear on or in the Software. 3.4 The structure, organization and code of the Software are the valuable trade secrets and confidential information of the Licensor. The Licensee agrees not to decompile, disassemble or otherwise attempt to discover the source code of the Software. 3.5 Any attempts to reverse-engineer, copy, clone, modify or alter in any way the installer program without the Licensor's specific approval are strictly prohibited. The Licensee is not authorized to use any plug-in or enhancement that permits to save modifications to a file with software licensed and distributed by the Licensor. 3.6 Trademarks shall be used in accordance with accepted trademark practice, including identification of trademarks owners' names. Trademarks can only be used to identify printed output produced by the Software and such use of any trademark does not give the Licensee any rights of ownership in that trademark. 4. WARRANTY 4.1 The Licensor warrants that: 4.1.1 The Licensor owns the Software and documentation and/or is in possession of valid and existing licenses that support the terms of this Agreement; 4.1.2 the Software conforms to specifications and functionality as specified in Documentation; 4.1.3 to the best of the Licensor's knowledge, the Software does not infringe upon or violate any intellectual property right of any third party; 4.1.4 the Software does not contain any routine, intentionally designed by the Licensor to disable a computer program, or computer instructions that may alter, destroy or inhibit the processing environment. 4.2 Except those warranties specified in section 4.1 above, the Software is being delivered to the Licensee AS IS and the Licensor makes no warranty as to its use or performance. The Licensor does not and cannot warrant the performance or results the Licensee may obtain by using the Software. The entire risk arising out of use or performance of the Software remains with the Licensee. The Licensor gives no warranty, express or implied, that (i) the Software will be of satisfactory quality, suitable for any particular purpose or for any particular use under specified conditions, notwithstanding that such purpose, use, or conditions may be known to the Licensor; or (ii) that the Software will operate error free or without interruption or that any errors will be corrected. 5. LIMITATION OF LIABILITY In no event will the Licensor be liable for any damages, claims or costs whatsoever or any consequential, indirect, incidental damages, or any lost profits or lost savings, even if the Licensor has been advised of the possibility of such loss, damages, claims or costs or for any claim by any third party. In no event will the Licensee be liable to the Licensor on condition that the Licensee complies with all terms and conditions stated in this License. 6. NON-WAIVER If a portion of this agreement is held unenforceable, the remainder shall be valid. It means that if one section of the Agreement is not lawful, the rest of the Agreement is still in force. A party's failure to exercise any right under this Agreement will not constitute a waiver of (a) any other terms or conditions of this Agreement, or (b) a right at any time thereafter to require exact and strict compliance with the terms of this Agreement. © 2000-2016 WebRocket Software. All rights reserved. By checking this box I confirm that I have read and agree to the WebRocketX license agreement. 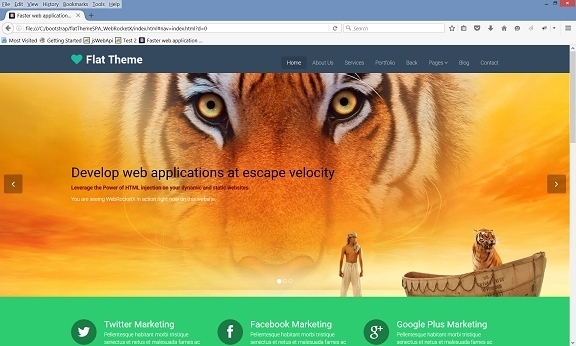 Download The Dynamic Web Application Template written in PHP. To make things as easy as possible, an entire working copy of the demo application is available for download. It can easily be modified to make your own application. Extract this file to your Web/PHP server. Go to your browser and navigate to the location of the welcome.php file on your webserver to see the application. For example http://localhost/WebRocketX_php/welcome.php. Download The Dynamic Web Application Template written in Spring MVC/JSP. To make things as easy as possible, an entire working copy of the demo application is available for download. It can easily be modified to make your own application. Included in the download is an Apache Tomcat 9.0.0 server for Windows 64 bit. The Java JRE 1.8.0_66 used by Tomcat has been included inside the Tomcat folder. The demo application is in the webapps folder and named browserDesktop. This implementation utilizes the Spring 3.0.6 MVC framework and JSTL 1.1.2, which are both included in its lib folder. Also included in the application is an overridden version of the Spring Dispatcher that outputs mapping and parameter information to the console for easier development. If the developer would like to install to a different OS or Tomcat version, all they need to do is setup a running version of Tomcat and then copy the browserDesktop folder to their webapps folder. Unzip this file on the root of your c: drive. If placing somewhere else you will only need to change the paths in the next step. Go to C:\apache-tomcat-9.0.0.M1\bin and open debugstart.bat in a text editor. Modify the paths to reflect where you are placing the Tomcat folder if needed. Run debugstart. This launches Tomcat in debug mode. Your OS might complain about this being a security risk because this software was downloaded from the internet. Confirm that it is okay to run. Go to your browser and go to http://127.0.0.1:8080/browserDesktop to see the application. To work on this application using Eclipse set you workspace to the webapps folder. You should see a browserDesktop project. Since you are editing the project directly in the autodeploy directory, any edits should be immediately reflected in the application. Download The Single Page Static Website (SPSW) Template. Based on Bootstrap. Not SEO Compliant - As of November 2017 ajax driven web applications, like WebRocketX SPSW, are still not Search Engine Optimization (SEO) compliant. As of 2015 Google announced that its spiders would be able to index ajax web applications, but our research has shown that this is still not the case. So, an SPSW is not recommended for a static website that needs its interior pages indexed by the major search engines. This is usually an important requirement for a static website, and usually not important for a dynamic web site. Here are the steps to install and use. Expand this file into your local file system. Firefox is the only browser that allows Ajax calls to access your local file system so it is the recommended browser for local development. All other browsers will require the developer to run a local webserver. It seems silly that the other browsers consider it a security risk for a local file to access a local file but that is how they work. Edit the template to build your website and follow the pattern of having all files other than your landing page be WebRocketX wrapped fragments. Navigate between pages using the getStaticContent call as can be seen in the template. 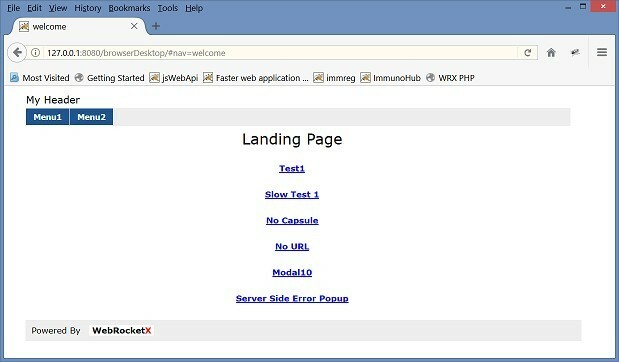 WebRocketX SPS websites are bookmarkable and refreshable. Upgrade your current version of WebRocketX. Version 1.5 added a new capsule attribute, so if you are using an older version of the "The Dynamic Web Application Template written in Spring MVC/JSP" you will need to replace metaCapsule.jsp with the latest version from the 1.5 template.